To find a CEF chapter, select your state and hit the Search button. You can also select your county (choose from the list). Looking for a way to reach your community this Christmas season? Adults and children alike enjoy a good Christmas party, and Child Evangelism Fellowship® (CEF®) has developed an extraordinary program called Christmas Across AmericaSM, a fun, evangelistic and innovative event for kids! Christmas Across America is a national effort that provides the means to celebrate one of the most amazing events in all of history—the birth of Jesus! How will this benefit my church? Most children are not regularly going to a church where they are hearing the Gospel. It is imperative that we share the true meaning of Christmas and the Gospel of Jesus Christ with children in our communities. As you reach out to your community, you will have the privilege of watching God work in the hearts and lives of children and adults alike. It’s a perfect opportunity to make connections with unchurched children and their families. What commitment is needed to teach a Christmas party for children? With the help of CEF identify an area for outreach. Form a team of three or more volunteers. Receive CEF training and background screening according to CEF child protection policy. Follow up with the children and families, connecting them with your church family. Contact your local CEF chapter for a Christmas party kit. See lives changed at your Christmas party! Please pray God will help us reach 100,000 children this Christmas. Please tell your church family and let your pastor know that you can be a part of Christmas Across America. You can reach the boys and girls of your community this Christmas. Flyers and posters will be included with your kit to help you promote the event. Remember to invite friends and neighbors personally. Start an event on Facebook or other social media venues to invite people in your community to participate. Encourage people in your church to do the same. If you would like to teach or host a Christmas party, contact your local CEF chapter here. Child Evangelism Fellowship is a Bible centered organization composed of born-again believers whose purpose is to evangelize boys and girls with the Gospel of the Lord Jesus Christ and to establish (disciple) them in the Word of God and in a local church for Christian living. 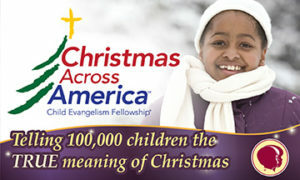 To find out more about Christmas Across America in your area, contact your local CEF chapter. Find their information at cefonline.com/locations.